Our age is obsessed with the natural world. We have learned how to manipulate it, control it, and we have delved many of its secrets. Of course there are many secrets which we have only just scratched the surface of. But the fruits of the pursuit of scientific knowledge are obvious and abundant. But we have become so transfixed with our knowledge of the world that we have mistaken this kind of knowledge for all kinds of knowledge. This kind of reality for all kinds of reality. Jesus’ words in the Gospel today do not make sense in a purely naturalistic world, where there is only nature, but no supernature. Where only the natural exists, the Gospel fails. For Christ did not come to organize communities, or to set up societies. No, instead, Christ tells us exactly what he came to do in this week’s reading. He came, it says “to bring fire to the earth.” But no, that’s not right. The Greek reads “I came to throw, or cast fire upon the earth.” Christ comes with a violent intention, to burn with fire, and to break like a hammer. He has come to cast fire on the earth. Now, fire consumes, fire destroys. Where there is only the weak, fire fully destroys. But where there are things that are made, not to resist, but to be refined by fire, it purifies. The fire that Christ comes to cast upon the earth is like this. It burns to purify that which is eternal by destroying all that is too weak and temporary to belong to the kingdom of God. It is a supernatural fire that comes with Christ. For He is the supernatural man. He is supernatural in two ways. First, in that he is God come into humanity to stand among us while remaining the living and Eternal God. Secondly, He is man, come into the Godhead to make a place for us women and men. He is the bridge that lays itself down that all might come to the Father. And like all bridges he connects the two lands, and has some share in both. The supernatural man, then, does supernatural things. He heals, he raises the dead, he says to the storm “be still!” He commands the earth as its rightful Lord, for he is above it, and greater than it. And here, he comes to cast a burning upon the earth, and how He wished in that moment that it was already kindled! Why? What is this burning that he wants to send into the world? Is it the Holy Spirit? Well, to some degree that is right, but we know that the Holy Spirit was already active in the world from the very first day. Is it the kingdom? He was at that time preaching the kingdom that was to be an image of the very country from which He came where love rules and peace is permanent. If not these, then what? What is the fire upon the earth? Look to your left and your right. There, in the pew ahead of you, and the one behind you. There is the fire that Christ has hurled to the earth to burn it. The Church, set ablaze by the Spirit who was given at Pentecost, living the kingdom that He has established, stands as fire upon the earth. 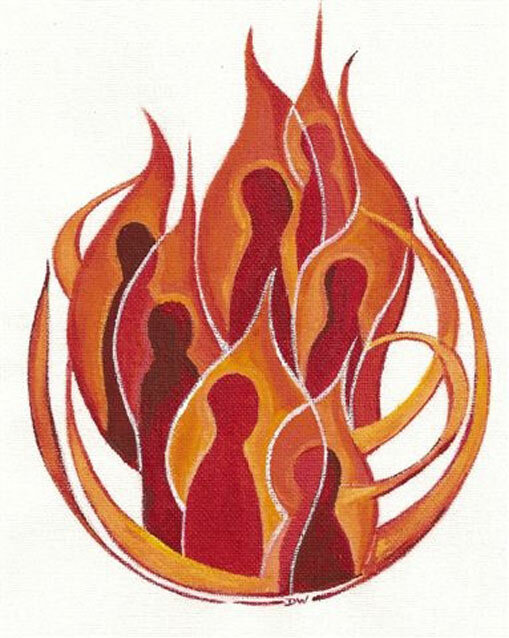 We are God’s fire, for we are in the Son, the Word that is like Fire, as Jeremiah tells us. The fire given to us in the Holy Spirit is the same fire that was in Christ, the heart and mind of Christ that sets the world ablaze. The Church, for whatever we think of her, her failings, her stumbles, her empty pews and petty infighting, is under all of that, the very heavenly life that God has become human to establish here. The fire that comes is the fire of the Trinity, lived supernaturally in the lives of natural people. The computer programmer, the bank teller, the construction worker, the lawyer, the bartender, and the retail worker all are elevated to the life of the burning fire of God. But lest we be deceived, we must understand the nature of this fire. It is a relentless destroying fire, for it burns away all that is natural to replace it with that which is supernatural. It conforms that which is passing away into that which is eternal. And what does the eternal look like? Is it a conquering majesty of armies, of haughtiness, of those who lord it over one another? No . . . it is a kingdom of forgiveness. It is the reign of love and mercy. The supernatural confounds our natural desires. The Lord Jesus does not come like the captain at the head of his legions of angels. He could have, but that is not His character, for it is not His Father’s Character. Instead, he comes meekly, calling us to the same humble life of service to one another. Come and take up his yoke, come and obey him, come and follow, taking up your cross. God is meek and lowly of heart, He forgives all offenses, he does not repay evil for evil, he has mercy at every turn. Come good people and live in the life of the trinity given now to you as fire upon the earth, and burn away all enmity, all hatred, all grudges, all judgment, all jealousy. Be fire that burns with generosity and love, and convert the world with your peace. We are to be a blazing light of obedience. This is the good news, that God is beyond our petty quarrels, and has called us to his life. Do you worry if you will be justified before him? Cast that worry aside and cling to Christ in obedience. For the Good Master is indeed Good, and no news is better than that He is Himself, this very man, Jesus the Christ. Rejoice, forgive your enemies, and which may be harder, forgive those you love, and be fire upon the earth until all else is burned, and only the eternal remains!